I blame Pinterest for many things. Off the top of my head, here are a few. I can never again guiltlessly purchase the little tear apart Valentines and send my children to school with them. Every minor holiday must be celebrated as an over-the-top extravaganza with special breakfast food and remarkably adorable after school snacks. Supplies for more crafts than I ever imagined existed are now cluttering up my house. Let’s be real. The craft supplies are relegated to my closet after I realize post-purchase that I am not now, nor will I ever be crafty. I despise everything in my closet because none of it is perfectly coordinated down to shoes, bag and belt. I obsessively want to work out and try the twelve cleaning tips I found this morning. There are at least ten things I do wrong as a mother every single morning before school (according to all the amazing parenthood books Pinterest has introduced me to). And don’t get me started on the change in my children’s birthday parties since Pinterest took over my life. That being said…. that darn red swirly P holds my heart forever because it gives me recipes like this one. Smothered is such an excellent word. Say it slowly with me. Smothered. Mmmmmm. Makes me feel all warm and fuzzy inside. I love meals that have so much good stuff covering your plate, you can’t even really tell what kind of meat is underneath. 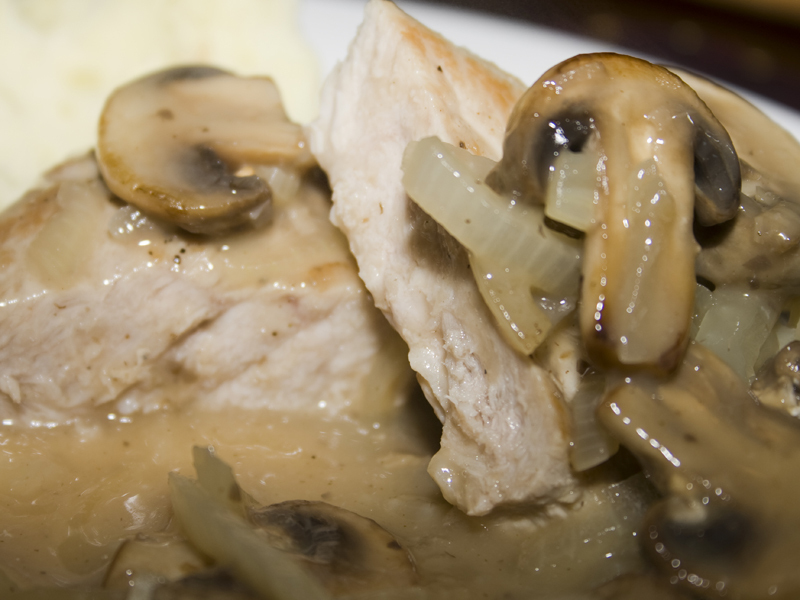 Careful not to overcook your pork (that is what’s hiding under all those shrooms and onions). You do NOT want it to be grey in the middle. Grey = overcooked, tough and dry. Pork is perfect with just the slightest of pink inside. The USDA recommends cooking pork until it is registers 145 degrees Fahrenheit on an instant-read thermometer in the thickest part of the meat. Keep in mind that larger cuts of pork (like roasts and tenderloins) can be removed from the oven at roughly 135 degrees, covered, and allowed to rest, during which time the temperature will rise by at least 10 degrees. Be sure to check the final temperature before serving to make certain that it reaches 145 degrees. 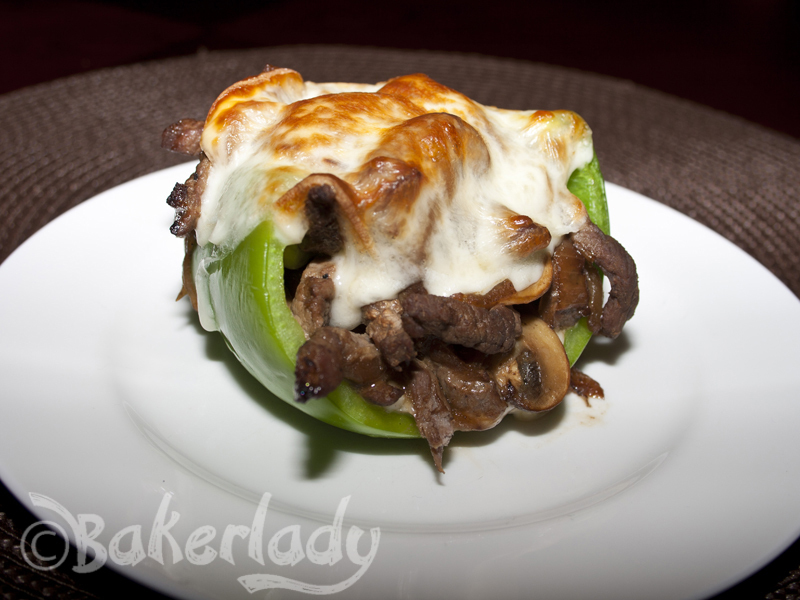 This dish is overflowing with sweet caramelized onions and tender sautéed mushrooms. All that goodness along with perfect pork chops swimming in a delicious gravy that is simply delightful atop mashed potatoes. Use my gourmet red smashers, they are ah-mazing. Season pork chops with salt & pepper to taste. In a large skillet, heat oil over medium high heat. Brown the chops on both sides. Remove to plate and tent with foil. Add onion and mushrooms to the same pan and saute for two minutes, until onions are slightly translucent. Add garlic and stir for 30 seconds then deglaze pan with the wine, scraping up any brown bits. Add milk and cream of mushroom soup to the pan and stir to combine with mushrooms and onions. Place pork chops back in the pan. Add the thyme and bay leaf. Cover skillet, and reduce temperature to medium-low. Simmer 20 to 30 minutes, or until chops are cooked through. I had just put this casserole in the oven when my husband walked in the door from work today. The first words out of his mouth were “Man, something sure smells good!”. I responded with “It could be the bacon, or the sautéed mushrooms, spinach and onions. Or possibly the Parmesan cheese cream sauce.” It was at that moment that I knew without a doubt tonight’s dinner was going to be ah-mazing. Oh momma and was it ever! Chicken Florentine is a classic dish that’s made by pounding chicken flat, rolling spinach, cheese and mushrooms inside, breading the rolls and then frying them. Much like Chicken Kiev or Chicken Cordon Bleu. I found the idea for a casserole version and could tell that with some adjustments it was going to be fantastic with much less work than the traditional rolled type. Chicken Florentine is normally served with rice, but I thought some nice mashed potatoes would be a much better vehicle for soaking up all the delicious creamy sauce in this dish. Mmmmmmm yummy! My husband and I were supposed to have an all day date today. We had tickets to see Tran-Siberian Orchestra and then were given two passes to a food and wine festival tonight. Unfortunately, my son woke up this morning sick. Like…you know…sick. Not the best way to be awakened on a Saturday morning. Bleah. Sick child meant the hubby and I were stuck home instead of out enjoying a kid-free concert and awesome food and wine. Bummer. I decided to make the most of my would-be date night at home. Made these smothered pork chops while listening to “Last Christmas Eve” on my cd player. Got the wine in the dish instead of at the festival, but hey. It works…right? 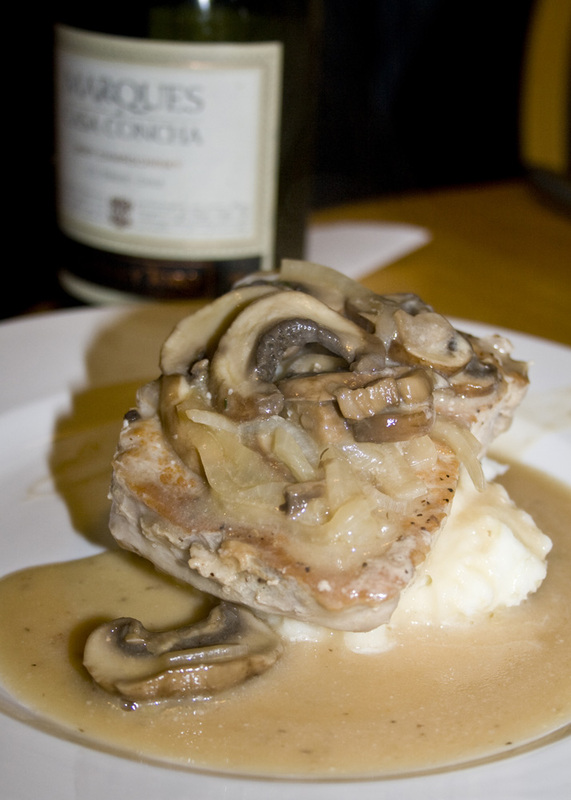 I love pork chops – they are just delicious. 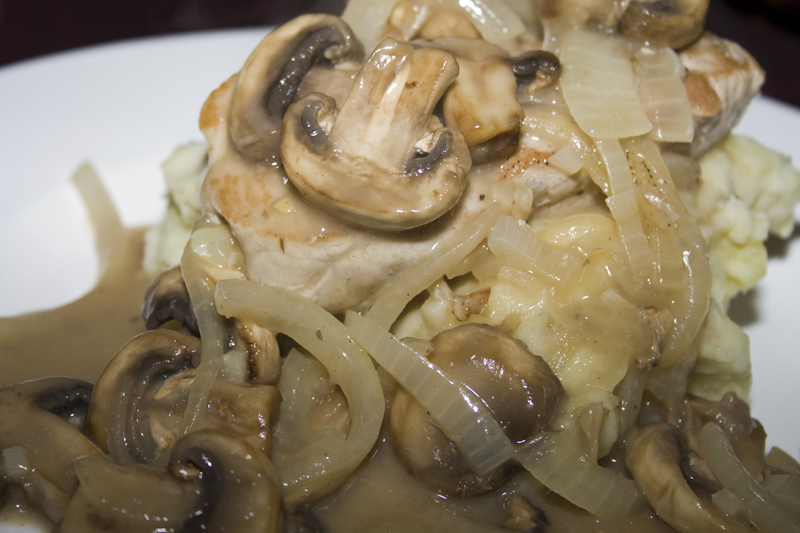 They taste amazing in this meal smothered with a creamy mushroom sauce. 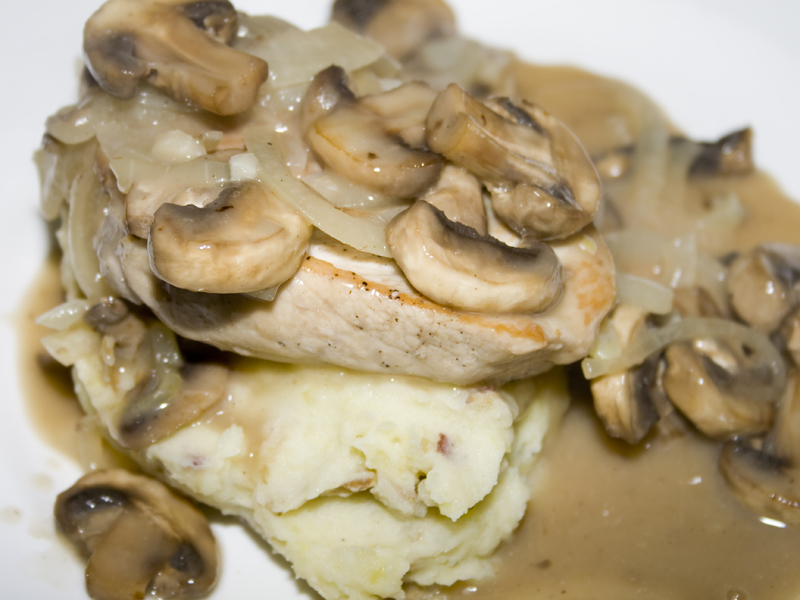 Mashed potatoes are perfect with these chops, you can soak up all that gorgeous sauce!